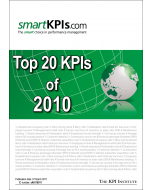 The Top 10 KPIs of 2011-2012 report is a synthesis of the most popular KPIs in 2011-2012, selected by the number of views they received from the smartKPIs.com community. 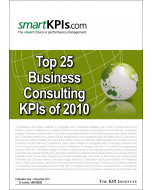 A detailed description of each KPI listed in the report, as documented in smartKPIs Premium (the premium content section of smartKPIs.com). 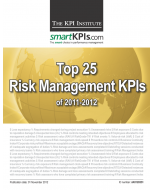 For a more complex analysis and insights on KPIs as performance measurement tools and a glossary explaining the most important terms describing KPIs, see the Top 25 KPIs of 2011-2012 reports. Describes the most popular 10 KPIs for 2011-2012 which are essential for improving performance across industries.